Our dedication to the cremationist continues with the development of the VPS - 1 Ventless Processor Station. With the growing concern for dust control by governmental agencies, the VPS - 1 recovers dust when transferring cremated remains into the processor and during packaging to ventless design. The VPS - 1 is designed to accept the ECP - 200 Processor and is the ideal compliment to any crematory. The ECP 200 is quiet, efficient, and effective. Average reduction time is less than one minute. Stainless steel and aluminum diamond plate construction provides a durable, professional and easy-to-maintain appearance. Gasketed lid for dust elimination. Extra large stainless steel hopper accommodates ashpans of all manufacturers and magnets will not stick. Stainless steel processing drum with convenient handles for pouring processed remains. Stainless steel or galvanized steel ash collection pans make clean-out easy. Ashpans are available for the following models: PowerPack Junior, Power Pak, Power Pak II, Super Power Pak and Ener-Tek II. *Please specify the model of the cremator to be fitted. Ashpans made to custom fit any cremator with a durable stainless steel or black iron ashpan. We can fit any make and model of cremator. 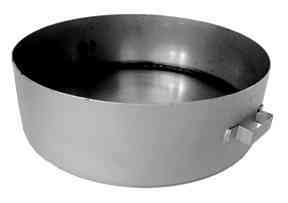 The ashpan pictured is stainless steel, 30" long, 10 1/4" wide, 7" high, and has a convenient pull handle. Please specify the model of cremator to be fitted. Small cremation pans confine small cases, making retrieval of the cremated remains much easier. Constructed of 12- gauge, 304 stainless steel for durability. The pan's compact size allows it to fit every type of cremator's chamber. These signs meet OSHA requirements for safety in your work place. Signs are white aluminum with red "DANGER" in reverse and black lettering.